Strong response and mixed results are a hallmark of our polls on Britain’s exit from the European Union, reflecting the divisions in the country as a whole. Last week’s poll was no exception, with 505 respondents and no option winning a clear majority of votes. Two options each accounted for about a third of respondents, with 34 per cent saying that negotiated access to the European single market should be the UK team’s priority in the upcoming negotiations following Prime Minister Theresa May’s invocation of Article 50 of the Lisbon Treaty last week, slightly ahead of the 32 per cent who thought that minimisation of non-tariff barriers should be prioritised. 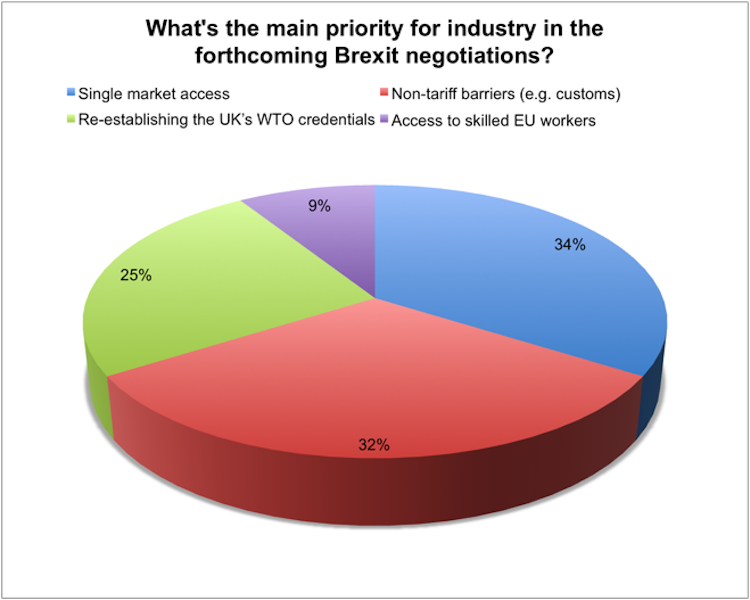 A quarter of respondents thought that re-establishing the UK’s credentials with the World Trade Organisation was the most important, and the smallest group, nine per cent, thought that ensuring the UK can recruit skilled staff from across the remaining EU states was the priority. Of course full and unimpeded single market access is the most important. That means being able to ship goods around without needing paperwork and customs inspections, let alone the possibility of having to run tariffs through the ERP systems. If in return for that the UK is forced to accept the benefit of access to skilled EU workers, then so much the better. The most important issue is BALANCED free movement of labour. I understand that there are similar numbers of people exchange countries between France, Germany and the UK, so that should be allowed to continue freely. But a mass exodus should be stopped. It doesn’t help a country to have half their workforce leaving, and it doesn’t help the country they go to. We cannot be both partially in and partially out of EU. The vote was for us to leave the EU. We need to leave. We need to be in a position after leaving the EU and all its red-line member rules, to concentrate on our ability as a sovereign state to trade freely with as many countries of the world as we can. The customs union will be a burden in that regard. If we can negotiate a clean, fresh tariff-free trading deal with the EU upon our leaving, that will be splendid. If not, then we have to be prepared to go it alone, as the fifth or sixth biggest economy in the world, get back our confidence unshackled by EU bureaucracy and make Britain Great again! But we mostly ‘trade’ paper, risk, and weapons. We make not a single camera, DVD system, data management process, domestic facilities and equipment…we do trade things and services we neither make nor own…and of course we have the Royals and the chocolate box-lid military to gawp at. Oh I forgot, we offer second (5th?) rate so-called higher-education offered by civil servants, whose primary purpose is to ensure their pensions and travel to unlikely seats of academic endeavour….I could go on: but so could you! Keeping access to the single market implies the continued free movement of labour within the EU and the UK. The need for skilled EU labour may not be a priority for many but the use of non-skilled labour from the EU within the agricultural and food industries where there is considerable use of unskilled labour from the EU. Losing access to this workforce will have severe implications on these industries and will ultimately affect the food supply situation. The “plan” of paying higher wages to attract labour from the home market will not work as UK citizens have been led to believe in higher aspiration than manual labour and would rather stay at home on benefits. These industries will lose a source of reliable, low cost labour which will result in raised food prices and an increase in imports as retailers try to reduce their costs by buying cheaper food from abroad. This is essentially a trade deal negotiation, both sides want to continue a very successful trade relationship, therefore the out come will be good for both. Sadly the mighty meja are enjoying the opportunity to theorise about the unprovable as part of an on-going fake news policy. There is no such thing as a hard or soft Brexit: the only outcome is a negotiated Brexit which will be speculated about by economists using their computer models which proved themselves so spectacularly in 2008. The world economy seems to be unwilling to listen to the Banks of England / OBR et al. and goes its own merry way. I suppose that a soft Brexit would be to give in to all the other sides demands and a hard one would be to refuse to consider reasonable demands???? Negotiations imply mutual benefit being achieved….. we could of course send the gun-boats in as in days of yore. A hard Brexit is one which is hard on both sides, but especially on the UK. That would involve losing the benefits of free trade and free movement. Thanks for that Alex, I’d thought that a hard Brexit was refusing to accept some of the EU terms and a soft one was caving in to the EU demands, such as a few billion in leaving fees. There is no such thing as free trade, all trade is by agreement. The EU have exploited the UK weak laws on protection of workers rights for years to close down the UKs paper, steel and car industries: it is very difficult to lay off workers in the wealthier section of the EU, apart from the UK. This is important – but Industry’s main concern should be with designing and making excellent products, with increasing levels of productivity. Ie looking at its own performance rather than using the issues around trade agreements to avoid this self examination. Many countries do not have trade agreements with the EU (US for example), but still make compelling products which are sold there, so let’s start on what Industry itself can do. It should also be searching for and lobbying against EU defined regulations which may be worth eliminating (eg ones around the invocation of the so called ‘precautionary principle’ particularly over chemicals and materials) and allow exports to parts of the world who don’t consider these limitations necessary. European countries will remain our largest export and import partners due to their proximity. We therefore need to make the thousands of daily transactions as cheap, fast and transparent as possible. We have decided to surrender free movement of goods, people, services and capital. We now need to be realistic and seek the next best thing. Personally I would also seek reassurances for our skilled workers from the EU, many of whom have been living and working in the UK for over a decade. The anxieties being expressed by some, re the trading situation with the EU is unhelpful and ultimately of secondary importance. It is worth pointing out, our trade with the EU is currently negative to the tune of about £60billions/year. I find it strange, so many so called “experts” want to see that negative trading situation continue and even expand? This is the type of data (Honest?) that is needed in order to understand the reality of the EU relationship. ” the agricultural and food industries where there is considerable use of unskilled labour from the….” If we substitute Central America and the Western States of the USA… for EU and UK they have exactly the same situation. And particularly for the food-gathering industries. Fellow bloggers will be aware of my regularly expressed concerns about the shear unadulterated greed of ‘retail’ mark-up: which forces suppliers to make their ‘profit’ from suppliers and staff? [I will remain silent on banks!] But in essence, the UK economy is ‘run’ by those who market and sell what they neither own nor make. Think about the activities in any high-street, if you are still confused: or those who sit at screens trading intellectual ‘puffs of wind?’ I believe the ‘hidden’ economy is some 6 times the real one. Small wonder it has such power: and little surprise that it can buy protection. Biscuit? -ours is already broken: it needs dunking in strong coffee. By any definition this must be true. I find it worrying that there seems to be a growing belief that any deal, however bad, is worth having. If the remaining members of the EU are not prepared to compromise at all – unlikely, but not impossible – then we should walk away from the negotiations and accept that such a situation does not represent a disadvantage, but merely the loss of a previous advantage. The rest of the world is still there and happy to trade with us. This would include Europe of course, just under different terms. This simplifies the exit negotiation requirements perfectly, how can a bad deal be ‘Good’ ? Remember the term ‘Great Britain’ well lets not forget WE can be that again, for too long we have followed the EU doctrine and yes that has allowed us to have ‘free trade’ within that organisation. We will have to make new deals with the big wide world, bring it on! I am proud to be British and look forward to being out of the EU, Europe will still want us as a market even if there is a cost involved for both sides. I understand our farmers are worried and rightly so with EU grants and migrant workers looking to be stopped, over to you Mr.Govt. to support them. This and no doubt a thousand more hurdles to overcome but overcome we will. The ‘Great’ bit is simply a corruption of ‘Greater’ used to distinguish the islands of Scotland, England and Wales from Lesser Britain, ie. Brittany, By Geoffrey of Monmouth BTW. I am sure that there are about 180 countries worldwide who would relish the idea of signing up good trade deals with world’s 5th largest economy. Britain was the world’s largest economy in 1910 and I am sure that with our vast depth of experience in trade, finance, legal and political leadership, that we are destined to succeed. It is just business, it is something we do well. We should all look forward to the challenge of developing a new world. A lot of people left Britain in the past, going to live in Australia, India, Hong Kong, New Zealand, America – anywhere but Britain. In return Britain got immigrants from India, China, Jamaica, Nigeria, Ghana, anywhere were people thought Britain is BETTER than their homeland. Then Britain told anybody who wanted to listen, that Britain is a great place to live in. And more people came to work here, to open grocery stores, work in factories, pick fruits, work in universities and in engineering. Britons continues to leave as soon as they got the money to buy a home abroad. Now Britain is telling the new taxpayers we don’t want you. But you can stay if your home country keeps our pensioners. Where is the home country of someone who has lived here for 30 years? Lesson: Don’t waste any time in Britain. They don’t want you, and even the Brits are leaving when they can. They are going to cancel contracts and don’t want to pay debts. They can’t be trusted. So if it all goes to pot in a couple of years time can we look forward to PPI Claims Solicitors calling us every day to ask if we’ve been mis-sold Brexit? Hahaha…that did make me laugh, thank you Steve! They won’t need to Steve, we’ve ALL been mis-sold Brexit! My question is, how are we going to know the difference between a good deal and a bad one? the amount of detail involved in such a deal is going to be so vast we might not know untill its far too late if we got a bad deal. with any trade agreement its not just was is agreed and in black and white but also what isn’t IE the ‘loop holes’ that can make a deal good or bad for both sides. I fear that those who voted for no tarriff barriers are likely to be disappointed. Once or negotiators twig that import duties = windfall income for the Treasury they’ll stop working on eliminating them & start working on ways of blaming everybody else for them.